OH MY GOD EMILY! I sound like a broken record but you are incredible, truly magnificent! Brilliant. I LOve your art!!! this unique illo has stunned me, as usual. It is very beautiful! I can feel the struggle of this bunny to get hold of bottle swayed away by the strong current. the choppy waves are well represented by your beautiful linework. Love the way you contrast the fish (which swim pretty in ease) against the strong current. Truly incredible!!!! You are the master of hatching and lights. Wow- amazing picture! 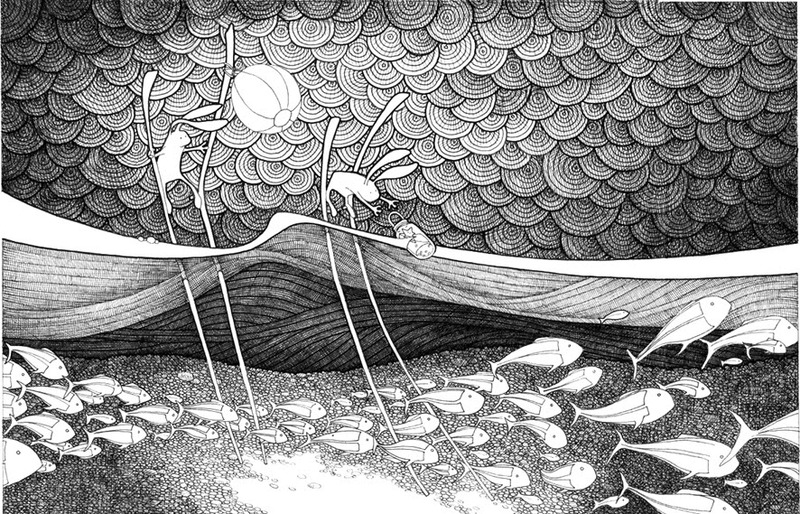 Love the linework and all the movement. i'm speechless! the quality, the line, the rhythm, the sense of motion, the light, the beauty... i am not worthy! I love the dramatic sky and the way you show what is both above and under water. Will they manage to recover Starfish? Wow! Love this! The patterns, the texture, the heroes... I can't believe I've missed your work before, bookmark! Wow - amazing! Fantastic piece of work! Beautiful, it reminds me of the piece I have hanging ;)! Wonderful work as always. OMG!!! !...I know I sound like a broken record but your illustrations always leave me wordless!!! this is so amazing! I still can't figure out how do you do such a large ammount of delicate hatching to create the perfect mood!...amazing! I just can't get over how much I love your work. You just keep on producing magic! Thanks for your comment on my blog. P.
emily, your magic touch shines through in every piece, very well done! So good it hurts in a most wonderful way. Such a wonderful sense of motion and beautiful use of value. Wow! This sectioned view of seascape is very interesting and that shoal of fish is really headed somewhere. wow what a beautiful scene, I love how you always include close up details. Emily, I love how the way the fishes swim, so amazing strong current yeah and so strong attachment to amazing illo asalways! 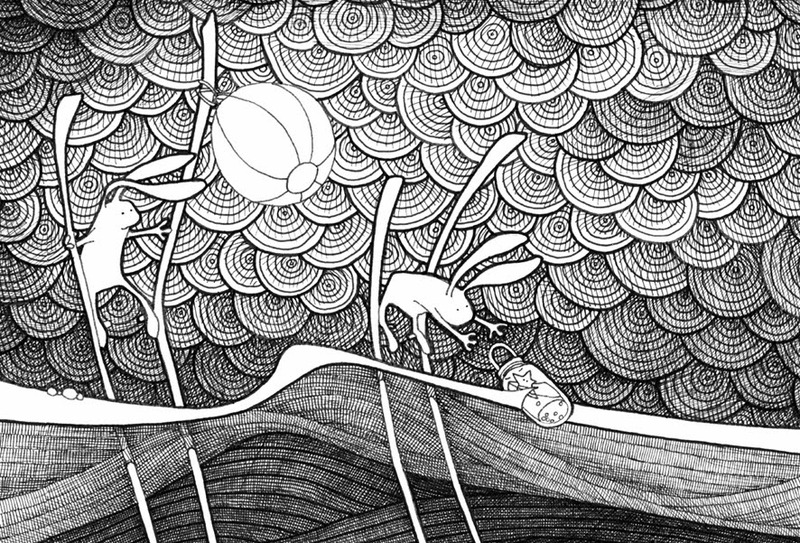 I'm not even sure where to start; these illustrations and all your work blows me away. Incredible. These are very beautiful, and I don't ususally like fish ! Oh, BRAVA, BRAVA, Emily!!!! If you could see me now, I am standing on tippy toe on my chair and giving you the BIGGEST standing O! I've just gotten lost in the past several months of your work, and I can no longer breathe. You know how much I love, love, love your work. All your patterns -- ooooh, the stormy sky!!! and all the fine lines and perspectives and treasures upon treasures upon treasures. I'm in love with it all! When is your book coming out? WHENNNNNN? Thanks Emily for dropping by and your encouraging comments. Take care. I look forward your new book release just like Bella said. Take very very good care. WOW...your work is amazing...how long does something like this take? The compositional aspects of this are superb! Love the effect of light you are using. Lovely, I always enjoy the rich stories you achieve to tell with your amazing compositions. Amazing ! As always ! All these little details !!! absolutely wonderful, amazing details, the tale withing the art the light! Have been enjoying your art for several years now. Love the textures, and the critters and the...everything.